Disney World planning fills some people (like me) with joy and happiness but others may dread the planning stages and go with the flow. I talked about what I learned from my first visit to Disney World before and I wish I had become more prepared with Fastpasses and plans etc, so this time around I have done a lot more research and planning. Everyone’s family set up will require something different to the next family booking their trip. Some children need structured bed times, whilst others can stay up later. Some families need more rest time for varied reasons for example. The one big mistake we made last time was staying in the parks all day and wearing ourselves out. I think we were too afraid to miss anything. This time around, I have learnt that we will actually get more out of the holiday if we give ourselves more rest. We are at the 60 day mark this week and I have been making sure I have spoken to everyone coming on the holiday to see what they would like to do. From this I have created a loose plan to try and make sure we don’t wear ourselves out but that we achieve everything we want to get done. I have been careful not to add too much into the first couple of days as we are a varied age range travelling and I want to make sure everyone has time to adjust to the new time zone. To get my plan started, I got a great tip from a work colleague to add everything into a spreadsheet. 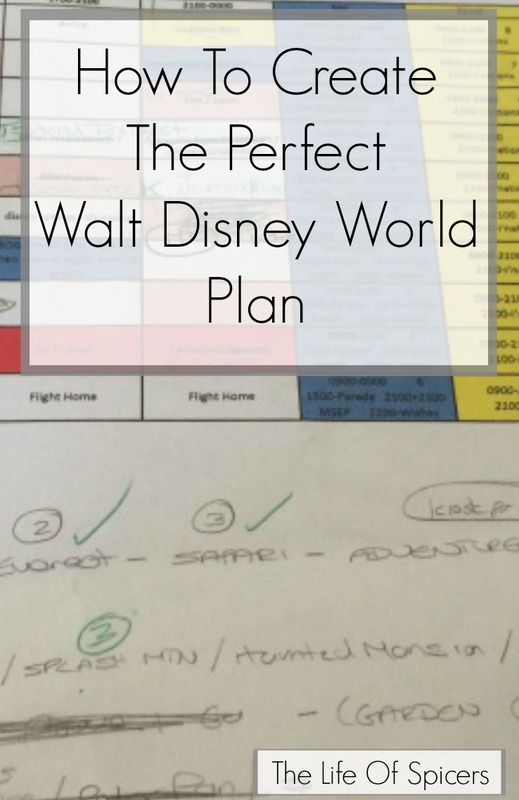 I have found this to be a great way to show my Disney World planning, and whilst not for everyone it means I can see exactly what it happening on each day and this can then be tweaked quickly especially as I filled mine in to begin with on the computer. I started with a blank spreadsheet and added colours and notes to correspond to ADR’s we had booked. Once we neared the 60 day mark for Fastpasses, the spreadsheet had been tweaked quite a few times. 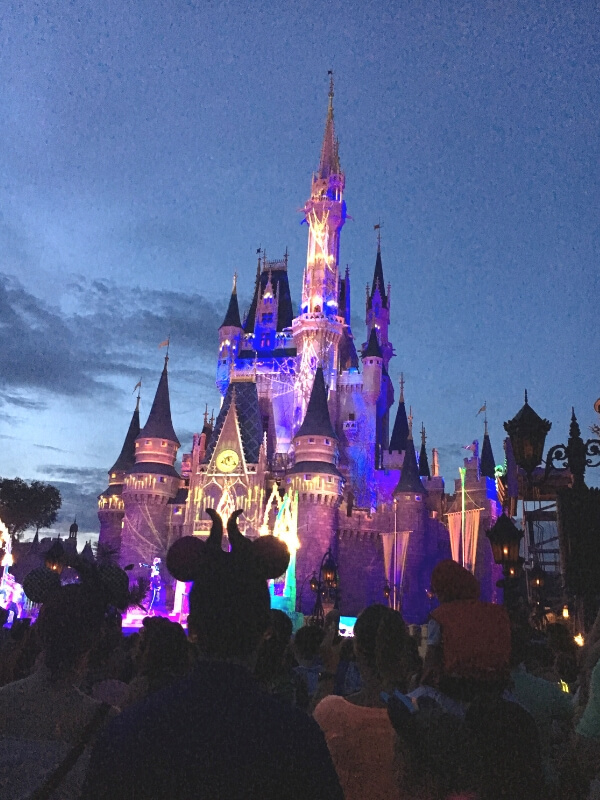 Disney usually publish their park opening times, Extra Magic Hours (if you’re staying in a Disney hotel such as the Caribbean Beach Resort), and parade times six months ahead. This is valuable for planning which days you may want to get up early and which days it may be best to have your lazy mornings for example. On my first spreadsheet I had allocated a morning for Magic Kingdom to see the welcome show, however when the park opening times were published I spotted that I had of course chosen the day that there was going to be extra magic hours at Magic Kingdom. I didn’t want to have to make everyone get up an hour earlier to see the welcome show, so the spreadsheet needed adjusting. By adjusting that one morning led to an impact on different days that surrounded as I was planning late nights for fireworks etc, and I don’t like to plan a late night followed by an early morning. If you don’t like planning via spreadsheet, you may like to draw out your plan in a notebook like this one. I have a dedicated notebook for Disney where I add all my bucket list ideas, and notes that I come across during the planning process. Think about travel days and time differences. If you are landing late afternoon EST but your body clock is hours ahead, perhaps late night fireworks aren’t a good idea if you’re travelling with small children. Your first full day may be a great excuse for an early morning park visit if you’re body clock hasn’t adjusted yet, but remember not to cram a full day in the parks as you will be tired. If the weather is hot leave the parks by lunch time and spend the afternoon by the pool or having a nap. You can recharge your batteries and return to the parks when the weather is cooler in the evenings. Don’t go to the parks that have extra magic hours in the morning as they are busier. Equally if a park has had extra magic hours in the evening before, go to that park the following morning as it’ll be quieter. If you schedule in late night fireworks, don’t plan an early start for the next morning. I am excited and ready to schedule in all of my Fastpass+ selections in this week. I have a list with times of my Advanced Dining reservations that we booked at 180 days before our trip so fingers crossed I am able to get all the Fastpass+ choices we want. Are you a planner or do you go with the flow on holiday? Does everyone have to have the same Fastpass+ if we are booked as a group? If you all want to do the same ride then you all need a Fastpass for the same ride. However every person gets three Fastpasses per day to begin with so if five of your group wanted to ride Splash mountain and five of you wanted to ride Seven Dwarfs then make five fast passes for each. If you use the My Disney Experience App you can group everyone in your party together and select individual rides for people.After you have ridden / used your three Fastpasses then you are able to select another for later in the day.